I love the above quote! It reflects so much from our deep ninjutsu heritage, which is completely apropos for the modern day we live in. How many of us are too reliant on our Government, food supply chain, work, etc? I would have to venture that most of us fit that bill, wouldn’t you say? Plant a garden – Do you know how many ninjutsu stories and lore stem from them being just a humble farmer or gardener? Learn skills that will aid you in being self-reliant. Yes, this mean work! Things like first aid, small engine repair, gardening, martial arts….start now and you will be glad you did. Alright here are 3 tips, to live a more “ninja like” lifestyle, so what are you going to do, just sit there or live the ninja lifestyle? So, if you have been on this site for a while you will know that there is a ton of information here to start your ninjutsu journey or to point you to new avenues of learning, and this year there is a big push to put out some awesome material for you all to learn and assimilate into your training, be ready, and enjoy! I hope you are keeping up with the facebook posts??? If not what the hell are you doing? Anyway, I would like to challenge each and every one of you to like our Facebook page and build our Ninja clan into a strong and vibrant group that can share information and training tips on an on going basis. Now this isn’t without a bribe( I’m a Ninja for cripes sakes!) anyway if we hit 500 likes, I will send out a few surprise to all of our fans! No I won’t tell you what it is, so get involved and pump up our clan! 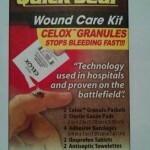 I happened to be strolling down the aisles of Walmart the other day and picked up a great addition to my first aid kit gear, it’s a small package called Quick Seal Wound Care Kit. 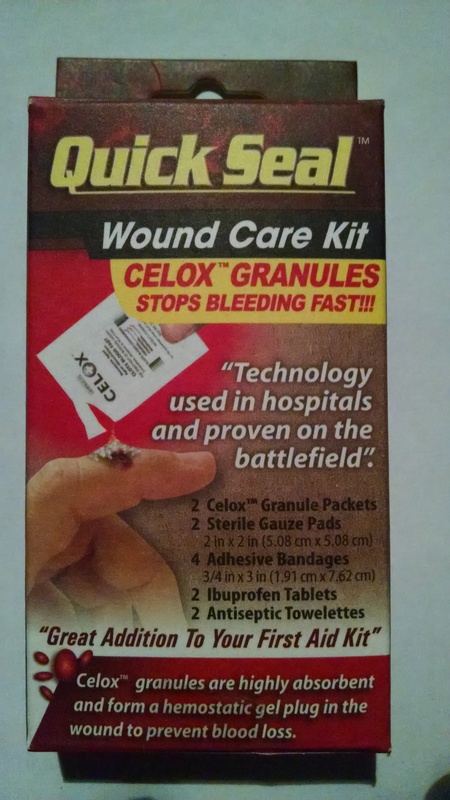 As you can see the kit contains 2 packages of Celox Granules, which for those of you who don’t know Celox granules(chitosan) have a very high surface area and when in the presence of blood, gel up and stick together forming a clot that stops the wound from bleeding. This technology has been used by the military for several years with great success in treating major wounds on the battlefield, allowing them to be evacuated for further treatment. This is a great addition to your personal first aid kit, for those rough training sessions or just when you or a loved one is injured. 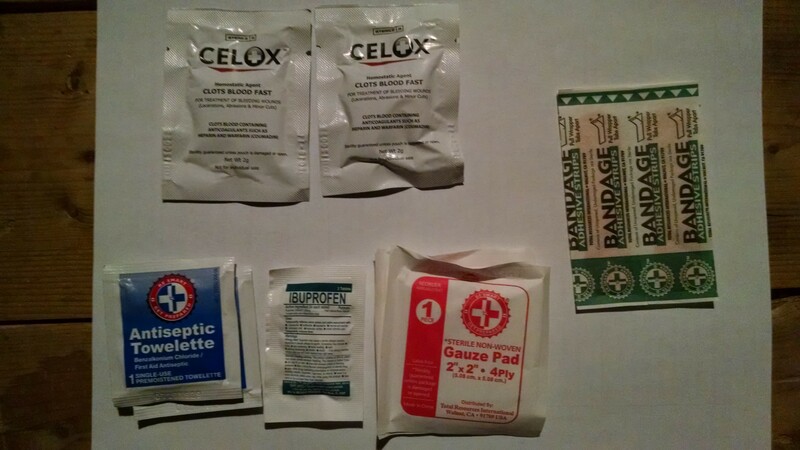 I am picking up a couple of more to add to my range bag first aid kit and one for my smaller lightweight outdoor camping kit. Have you guessed the first Ninja Skill building theme yet? 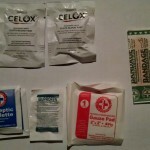 Yep, you guessed it —First Aid! ps: Don’t forget to stay in tune with our Facebook page, more information is up on the page each week! Building the Ninja Clan, 1 Genin at a time!